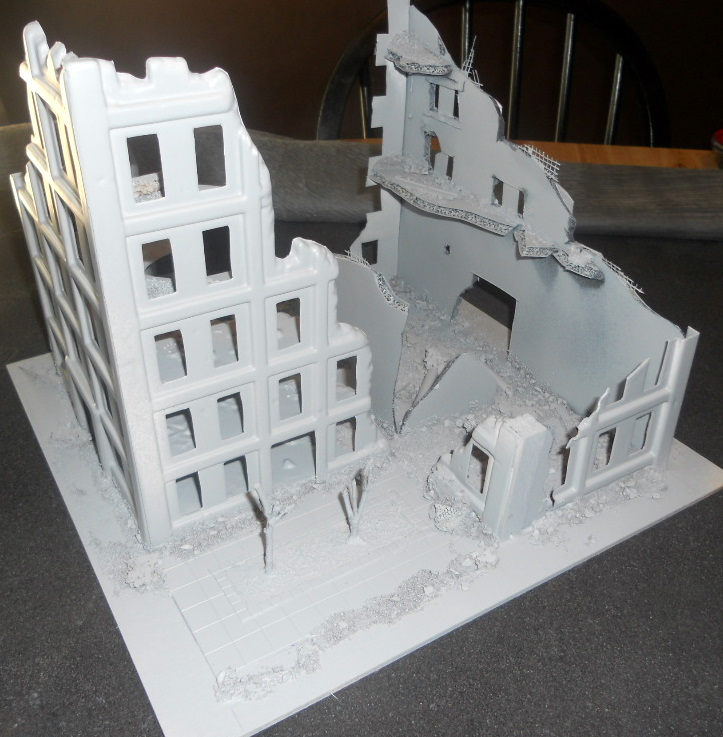 Not too long after watching “The Book of Eli” and “I Am Legend” in the same week, I came up with this crazy notion to make myself a table of urban terrain for my 28mm skirmishes. Not a piece of terrain, but a whole table full. You see, infantry skirmishes work best in dense terrain, and so I figure, what’s denser than a city? 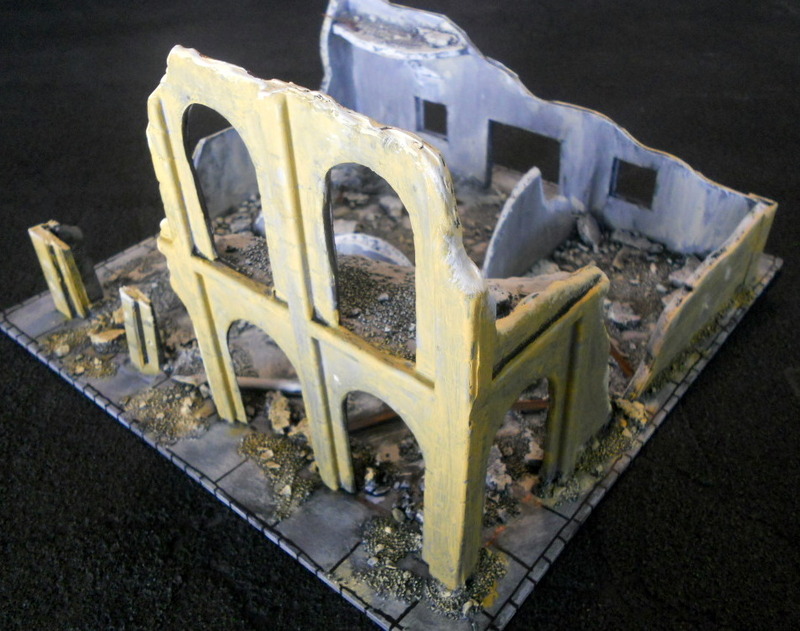 Unfortunately, most wargame tables have huge expanses of open terrain, with maybe a few buildings scattered around. I wanted to avoid that. 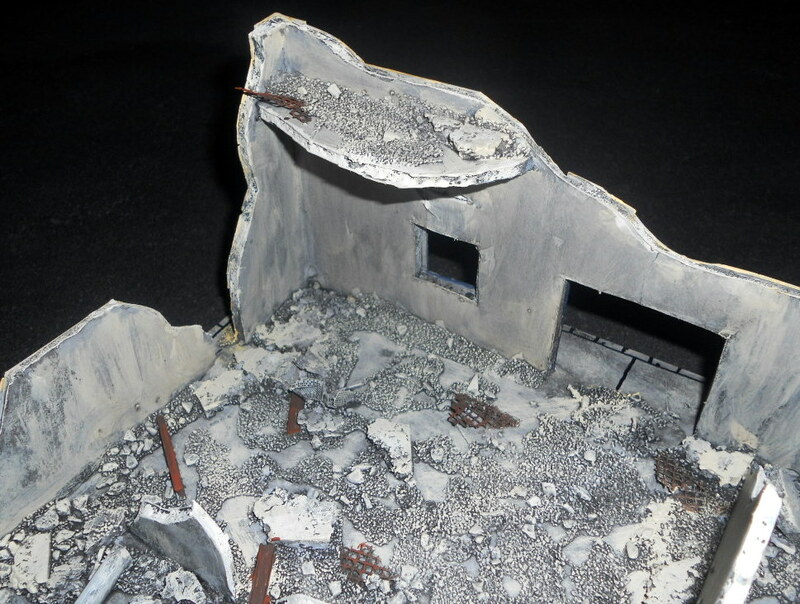 On top of that, I wanted to go with rubbled buildings. They can serve for WWII through modern battles, science fiction battles, or post-apocalypse. But cities are laid out in a somewhat regular pattern, with blocks in a more or less even sequence. The Amera buildings were not whole structures but rather fragments of shattered buildings. I wanted to be able to plunk down complete blocks – sidewalk and all – and leave the Zuzzy mat visible as the street. Clearly, I was going to have to expand upon the building fragments in order to create whole blocks. I started out by buying 9 square plywood tiles measuring 12″ x 12″ and 1/8″ thick. 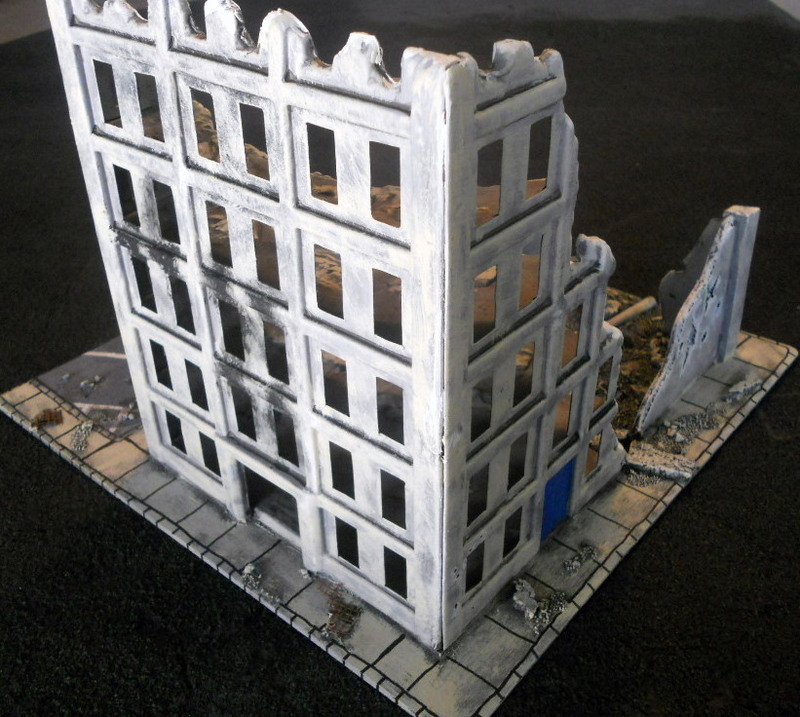 These would serve as the bases for the city blocks, and would be able to cover a 4′ x 4′ table (which I figured would be plenty of room for an urban skirmish). I then assembled the Amera plastic buildings and glued each of them down onto a plywood tile, trying to leave 1″ on each edge. This extra inch would be the sidewalk. But there was still a lot of area on the tile that was uncovered, so I built walls from black foam board and other materials. 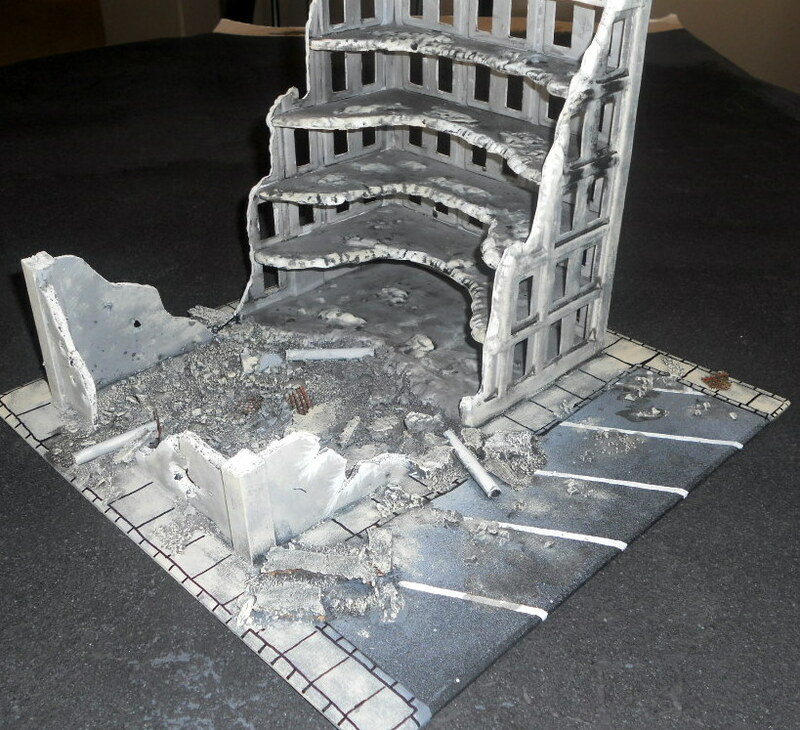 Battle damage was cut into the foam board with a very sharp Exacto knife. I found that if you try it with a blade that is a little dull, it just tears the paper and doesn’t look good. I also came up with a system for applying the rubble. First, I spread a liberal amount of wood glue (works a lot better than craft glue and is much more durable) All over the floors, and a little bit on the sidewalks. 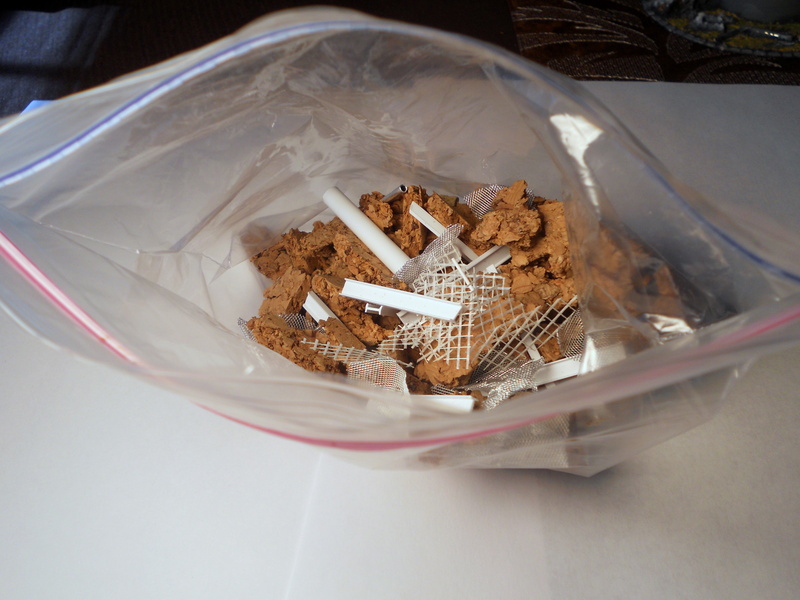 Then, I shook out about a fistful from the “big chunks” mix, and let that fall randomly into the glue. Then, I poured even more glue down, partially on the big chunks, but not completely covering them. I also tried to get a pretty good layer in all the corners wear the walls meet the floors. Now here’s where it gets kinda messy. 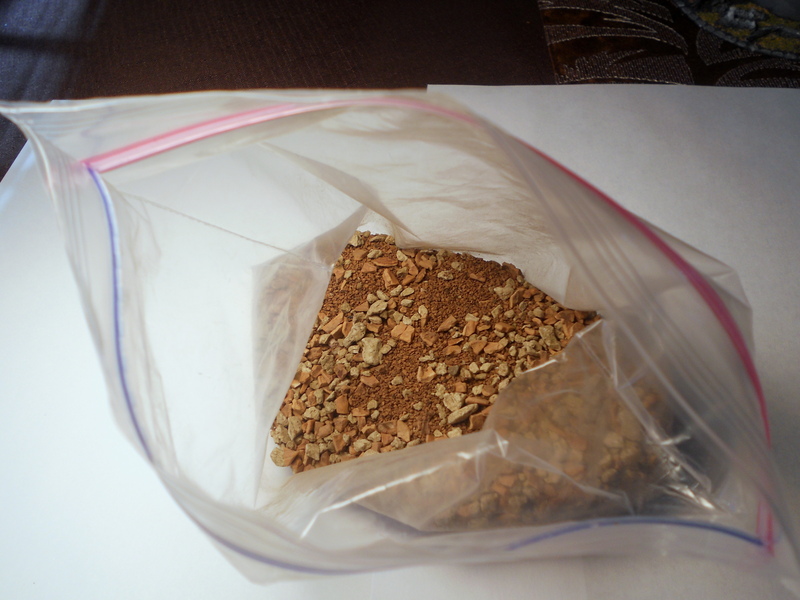 I take a handful of the “sand and gravel” mix and pour it over any glue that’s showing. A lot of sand and gravel falls off at this point, so I found it’s a good idea to have something underneath to catch it.Finally, I cut slits in some of the “broken” sections of the foam board walls and floors and pushed a few irregular pieces of mesh in and glued it to simulate re-bar sticking out of the shattered concrete slabs. After this all dries, it’s ready to be painted. I start by spraying the whole thing with gray primer, as in the photo above . 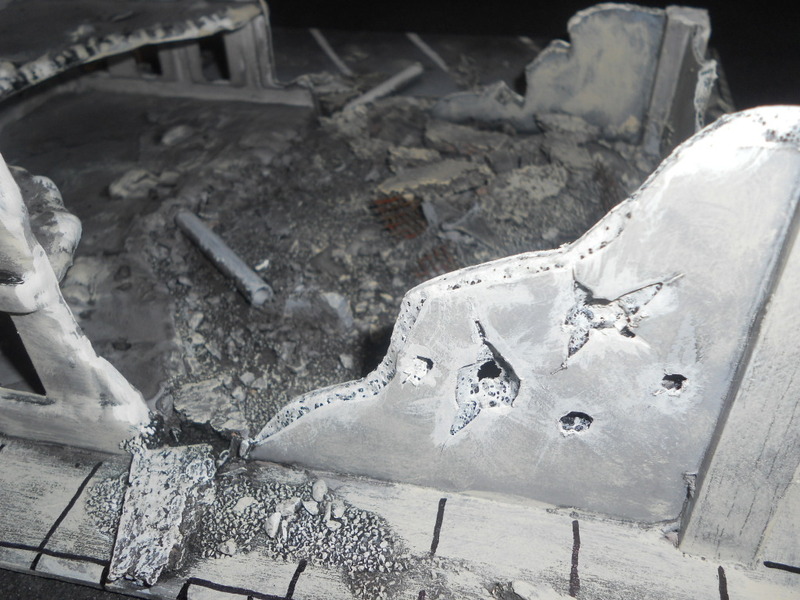 This kind of eats away at the exposed center of some of the foam board, which you can kind of see in the photos, but I thought that actually enhanced the appearance of the rubble. I then gave the whole piece a dark wash of black and brown and let it dry. 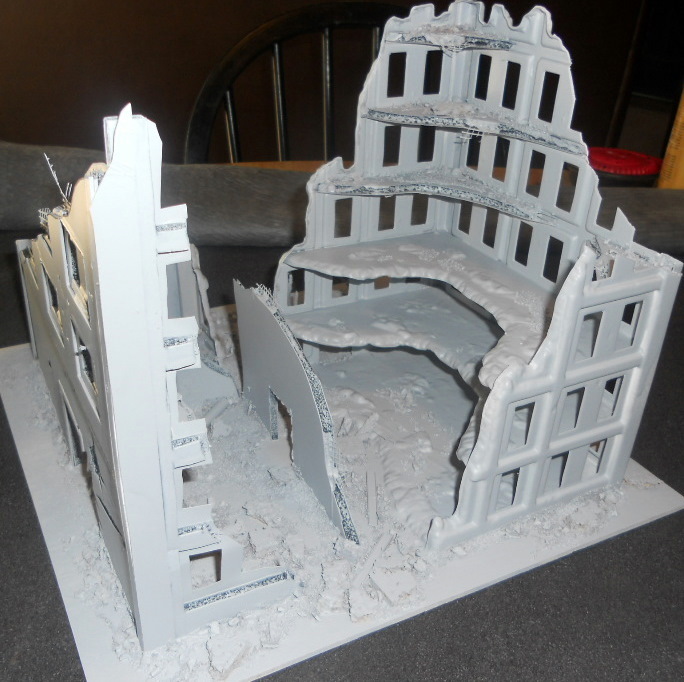 This will make the rubble and gravel stand out sharp relief. After this dries, I dry brush the whole thing with a lighter color. Rather than white or light gray, which really doesn’t look like concrete. I used something with a yellowish tint. Look at some real concrete out in the sunlight and you’ll see what I mean. The paint I used was an acrylic from a craft store, and the color is called “sandstone”. When dry brushing the walls, I found that it’s ok to have vertical streaks. It just adds to the impression of a trashed out building. 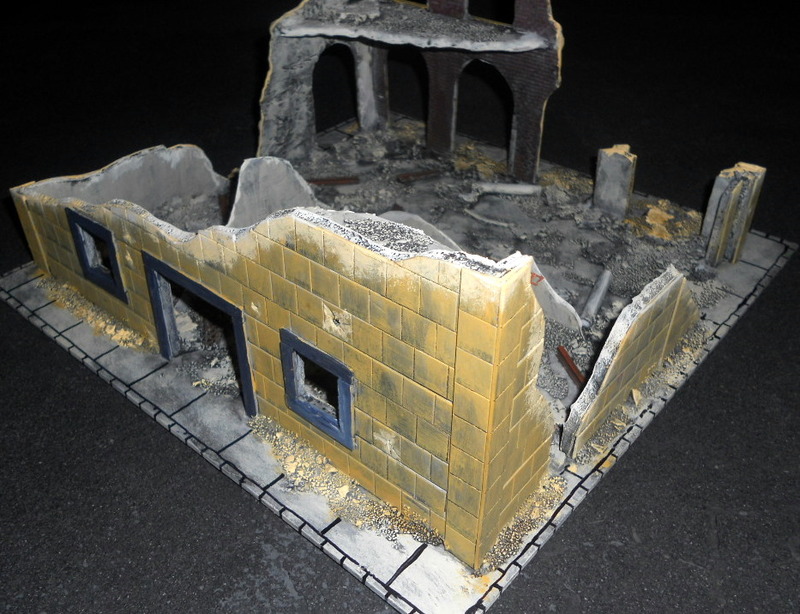 For the broken edges of the concrete and the battle damage, I whitened the sandstone color and dabbed it on the edges. I then painted a few details, such as doors and window frames. I also painted all of the I-beams and exposed mesh to look rusty. I also painted some of the walls a different color than concrete, for a little variety. Finally, I drew the sidewalks in with a black sharpie. I debated for a while whether I should cut grooves into the plywood to depict the sidewalks and eventually decided that they look fine drawn in with a pen and it only took a fraction of the time. And I didn’t really measure the lines too strictly, but just eyeballed them, figuring the rubble would hide any lack of uniformity. With some of the future buildings, I want to add more details to make them interesting. Maybe some wrecked office furniture or bits of broken glass (simulated, of course), some graffiti. One thing I’d really like to find are small, raised letters, so I could make signs above doors, and things like that. If anyone has any idea where I could find or make something like that, I would appreciate any suggestions. I’ll post more of this project in the future as I complete it.